Warm beer is not a delicious & refreshing beverage. What is the most expedient way to make beer cold? We expect that the fridge will be the slowest option, while an ice-water bath will be fastest. Eight identical beers for the cooling experiment. record temperature of the well chilled beer. Science on that beer is now done, make the beer vanish however you wish. measure the temperature of each beer with the instant read thermometer, this is your time = 0 measurement. record temperature measurements of each open beer every 10 minutes. After several measurements, adjust the measurement frequency as desired. After 4 measurements (40 minutes), we started taking measurements every 20 minutes until the experiment was concluded. Beer pairs in ice (left) and ice + water bath (right). The cooler lid was utilized between measurements. Two beer bottles were used in each cooling method to check the influence of having the bottle open to allow measurement. The plot below shows the cooling trends of the different beers. Note that there are actually two time zero measurements…. 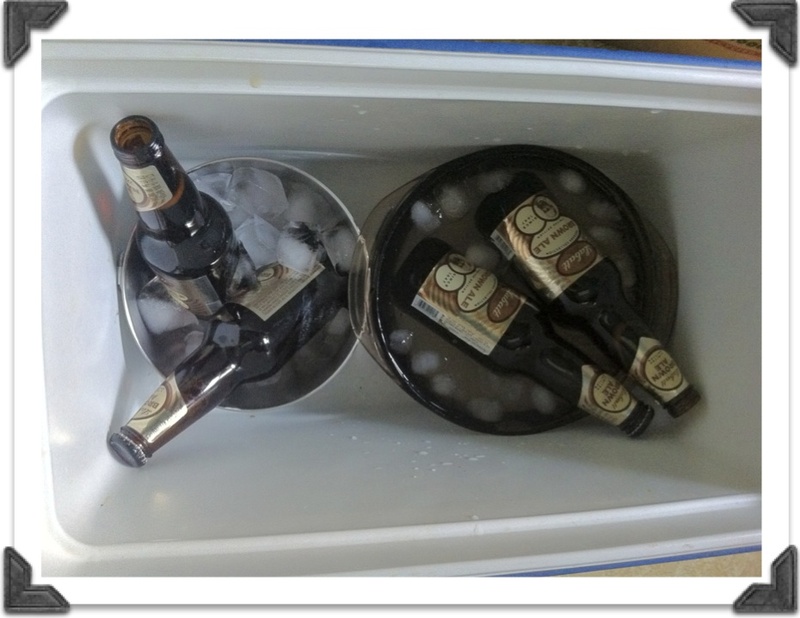 while it was fast and easy to stick beer pairs in the fridge and freezer, it took a significant (while unmeasured, based on the cooling slope for the freezer sample this was likely ~ 10 minutes) amount of time to set up the ice bowls + cooler. By the time the clock was ready to be set, the freezer sample had already dropped almost 5°F! The fridge sample had only dropped by 1°F during this time, so impact was minimal. The procedure given above should prevent this timing-science faux pax. Beer cooling trends for different make-beer-cold environments. All beers started between 61-62°F. The Probe thermometer only reads in 1° increments, but within that rounding range, agreed with the instant read used for the other beers. 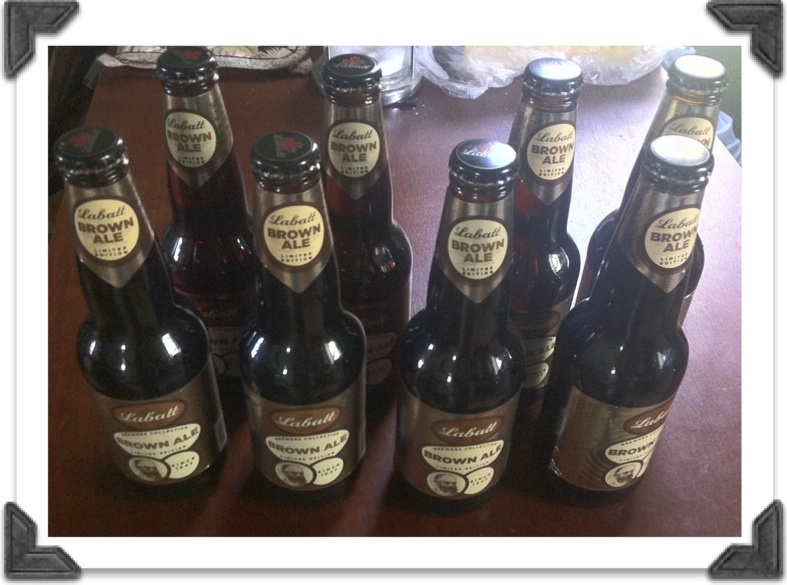 Upon removal from the various cooling environments, the unopened beers were within 1°F of the opened beers. The ice (no water) trend is a bit bumpy, with an increase in temperature between 20 and 30 minutes, and a steep drop between 120 and 140 minutes. Due to the large size of our ice cubes, these thermal bumps are likely due to irregular contact with the ice cubes. Additionally, by the end of the experiment, the ice was producing its own water bath, which may have facilitated cooling near the end. The ice+water trend shows a significant slowdown after 40 minutes. Occasional temperature checks of the ice-water bath indicated it was at 40°F at 20 minutes, and 37° at an hour, and again at the end of the experiment. Due to this, the ice-water bath dropped the temperature of the beer rather quickly until the beer reached 42°F, but then the temperature difference between the ice water and beer was too small to continue at a rapid pace. The beer in the freezer cooled the fastest by a significant margin (even if you tack on a 10 minute penalty for the issues stated above)! Additionally, while the bottle pairs were close in temperature, the unopened bottles were always colder than the opened bottles. Placing beer in the freezer was the quickest method for chilling the beer. However, depending on your personal, beer temperature consumption threshold, ice+water could also be efficient if you needed to chill more beer than could be stashed in the freezer. If 40°F is acceptable, the ice+water technique reached that in an hour. However, an additional hour was required to drop it just another 2°F. This is because the ice-water the beer was sitting in was stable at 37°F for the last hour of cooling. 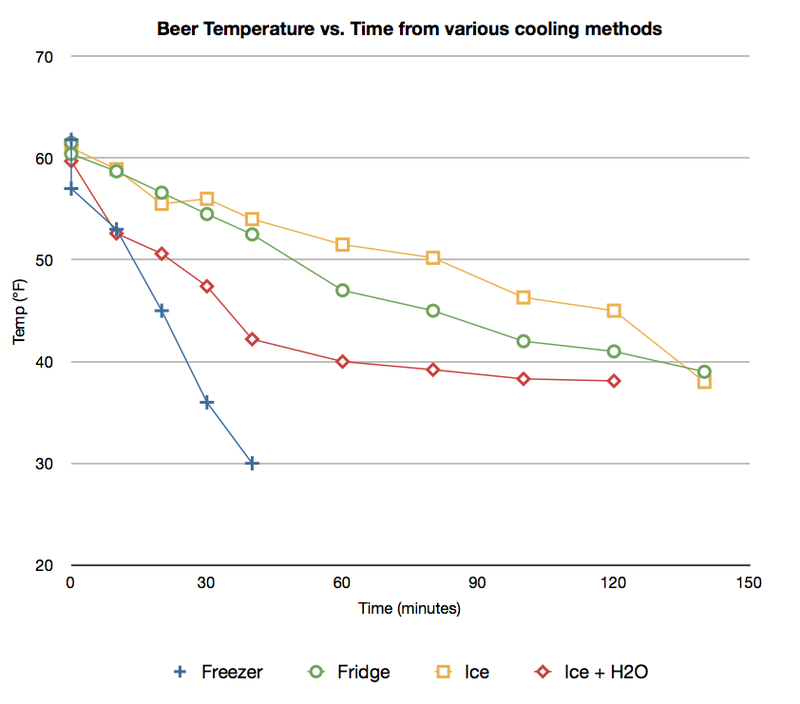 Additional ice volume may make cooler-based beer chilling more competitive, and an added bonus is that you would not have to worry about beer slushies. Does using aluminum can packaging change the cooling trends or ranks? Does beer of higher or lower alcohol content behave differently? Would smaller ice cubes be beneficial? How would heavily salted ice water compare? Note that we considered using salted water, but we (1.) only had 8 beers, and (2.) we didn’t want to deal with disposing of the salty water. Note that Mythbusters (links below) claim they were able to chill beer (in aluminum cans) in 5 minutes using this technique. While not stated in the show, it looks like a full pound of salt was used, and that they let the salt/ice/water reach equilibrium. I don’t have any data, but I am a big believer in an ice/water/salt combo. I’ve used that for wine bottles that need to be chilled ASAP. I’d also like to see if swirling the bottles (or cans) in the ice bath has any impact. The liquor department at my local grocery store has a chilled (but not ice cold) water bath that can be used to chill wine bottles. The instructions say to speed the cooling process, one should slowly swirl the bottle in the water, presumably to swap the cool liquid by the glass with the warmer fluids in the middle of the bottle. Why do you suppose the unopened bottles were cooler than the opened? I would have suspected the other way around, as the opened bottles would have more surface area for heat exchange (at least in the freezer). The swirling idea sounds like an interesting one! I think we will try the salted-ice-water combo in our next treatment of that topic, but I would hesitate to do that with a cooler, unless I could drain it someplace where the salt wouldn’t adversely affect vegetation…. As for the unopened bottles, it might have something to do with the pressure change + gas release upon opening the bottle…? If the gas expands after the initial pressure release (so we can assume gas expansion under constant atmospheric pressure), the temperature of the gas must increase based on Charles’ Law, and that energy could be drawn from the surrounding liquid, causing a (subtle) drop in the temperature of the beer. Awesome post! And congrats on being FP. Personally, I like step 15 the best. Always a good to do this step after a long arduous experiment done in triplicate parallel. Or, you could make 15 a beginning for the repear experiment, and see how the experiment changes through each 1 to 15 cycle!